During the winter our pallets prefer a darker, maltier, and stronger beer than when it’s hot outside. Different seasons present different reasons to drink a particular type of beer. Your body reacts differently to various temperatures and that sometimes calls for a certain type of beer. This isn't about changing what you drink every day, but this is about something that can be a nice compliment to your favorite year-round beer. Seasonal beers might be a marketing gimmick for breweries, but they also serve the customer. The branding of seasonal beers can remind beer drinkers that there might be a different beer to enjoy than usual. The marketing allows these kinds of beer a larger presence at bars and retail outlets. During the summer we want a cold beer that we can drink quickly. But winter is different. Van-Alan Nguyen is the co-owner of my favorite craft beer bar in Las Vegas, 595 Craft & Kitchen, and he reminded me why this is my favorite beer season. Beer during the summer months tends to be lighter and easier to drink. Since they have less alcohol by volume (ABV), it’s easier to drink more beer. As he puts it, these beers are "crushable”, and I like to crush a good beer. My mouth also prefers IPA and these also fit in the summer beer category. With Winter right around the corner, I wanted to look at a beer that might make the cold months of the year pass a little quicker. During the winter our pallets prefer a darker, maltier, and stronger beer than when it’s hot outside. Winter beers tend to be darker and boozier than your everyday beer. There are actually a lot of types of beer that suit the winter months. 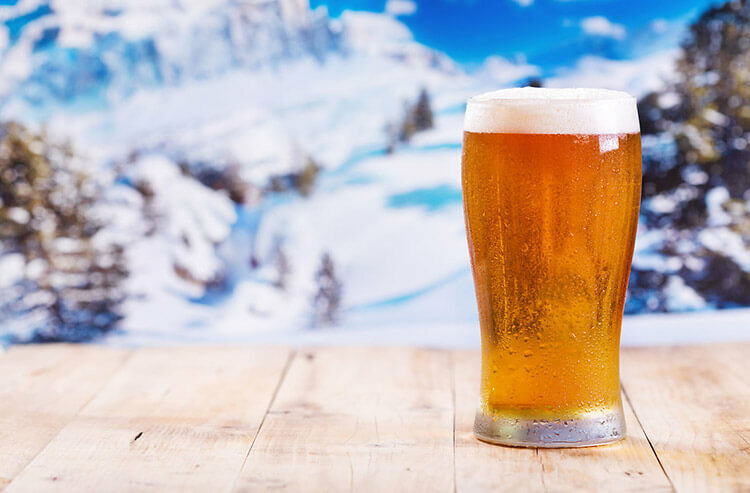 Nguyen says stouts, barrel-aged Saisons, imperial stouts, double or triple IPA's, and Belgian style beers are all different types of beer you should enjoy more during the colder times of the year. Many of these styles of beer have a higher ABV between 10 percent and 12 percent. For reference, this is about twice as much alcohol as a Bud. These beer styles tend often have flavors that you’d associate with coffee. You'll find hints of sweetness like hazelnut, cocoa, and vanilla. Then I found a unique flavored beer that’s perfect for any time of the day. Covers’ own Patrick Everson loves French Toast like nobody else you know. In homage to my Las Vegas partner in crime, I tried the French Toast from Decadent Ales. This Imperial IPA hit all the flavors you’d expect to find French Toast. There are notes of vanilla, cinnamon, and maple syrup all wrapped up with a drinkable beer. But back to winter beer flavors. Some beers step away from the coffee and over to bourbon barrels. Based on experience these are not beers that you pound. These sipping beers are delicious but take a little time to drink, in part, due to their high alcohol content. Seasonal beers aren't difficult to find nowadays. They're available in some way or another at most places you buy beer. However, not every beer manufacturer makes small beer batches for every season. The large beer corporations are more concerned with selling the beer someone will drink every day, so you won't find "Bud Winter." These companies continue to buy smaller microbreweries and that's how you might easily find a winter beer. Craft brewers are where you’ll find most of the beers that are suitable for winter. The big beer corporations will often place a seasonal beer from a smaller brewer that they own in their distribution network. You should be able to find a winter beer from Elysian or Goose Island wherever beer is sold. There are plenty of craft breweries that will make beers suitable for the winter. Sam Adams, New Belguim, Rogue, Stone, and Anchor Brewing are familiar craft beer brands that have large distribution networks. Likewise, you’ll find plenty of great options from local breweries that may only be available in your area. Nothing. Seasonal beers are just a fun way to shake up how you booze. These beers provide a nice compliment to the beer we drink on a regular basis. It's nice to find an "excuse" to shake things up. Variety is the spice of life and beer is a big part of most of our lives. Follow our "Man About Town" in Las Vegas Marc Meltzer on Twitter @MeltzVegas.